Fierce storm near Tjuntjuntjara. Pic ©Claudia Jocher 2019. Clouds loomed in dark grey and black layers, towering to the north-west of us. The storm approached the small community of Tjuntjuntjara (pronounced Joon-joon-ja-rah) in the remote Great Victoria Desert of Western Australia. The little plane rocked, buffeted by strong winds. I tightened my seat belt. We left Adelaide airport just after sunrise, with the hills lit pink and gold. I felt a bit giddy: excited and overtired, running on coffee and five hours’ sleep. Health worker colleagues, mostly doctors, flew with us to other remote places on the way. There were ten people on the plane all together. Before we left, the pilot, a friendly, competent man, calculated the weight the plane was due to carry. Claudia and I were up late the night before moving boots and shirts between bags to distribute weight evenly. I’d left my coloured pencils, books and magazines behind on the East Coast. I was glad I didn’t eat a big breakfast. Out on the strip, the pilot lifted our luggage powerfully, sorting it like a coach driver, with ours at the bottom. Tjuntjuntjara was the last stop on the six-hour flight. Also coming there was Dr S. He was finishing up in the role that would be my new job. A venerable and affable man dearly loved by the Aboriginal people he served, he came with us to give me a handover. I was aware of big shoes to fill. Many Spinifex families were affected by nuclear bombs exploded on the Maralinga Lands by the British and Australian government last century. The people were moved to Cundeelee, across the border in Western Australia. Processing loss, recovering from blind barbarism, the people longed to be back on their Country. They spent a decade or so looking for the right place. Tjuntjuntjara began as a camp around a bore. Twenty-five years later, it’s a mellow, sustainable community. Claudia and I went there to work several times in 2014-15. It felt good to be returning. The plane lifted up into clear skies, over modest farming houses and immodest mansions, nestled in the green and brown hills which sloped down to suburbs of silver roofs. We flew over an industrial port: square emptiness, huge cylinders, collections of giant boxes with gantries and cranes. Concrete wharves intruded into limpid aqua and then cobalt blue water. I saw hundreds of houses built on sand and thought of islands I’ve visited which are already subsiding under the rising sea. Will all those houses be gone in thirty years? Claudia and I drove around the ocean gulfs that flood the middle of South Australia on our way to Tjuntjuntjara in 2014. It took us about a week to drive there. Motoring down the western side of the Gulf, we were startled by emus racing the car. One ran in front of the car for a mile or so, before elegantly hurdling the wire fence beside the road. “Wow. I never knew an emu could do that,” Claudia said, in awe. The roadhouse in Kimba had a giant metal galah on its roof. I explored the lapidary collection there, somebody’s life-work, with specimens marked at clearance prices. Claudia discourages me from collecting rocks on our travels. I paid tribute by looking, reading the hand-made labels. The Big Galah at Kimba, South Australia. Photo by Adam Eales. Now, our compact metal tube, noisier than a flock of galahs, seemed to hover over the Gulf’s deep waters. After speeding along in jets at seven hundred kilometres an hour, our plane seemed to go very slowly. I rested my head against the window and slept a bit. I woke abruptly, a bit embarrassed by my fatigue. We traveled through continents of cloud. Canyons of luminous cumulus rolled below. Charcoal patches, pregnant with rain, loomed then surrounded us. I felt nervous as the plane dove right through the clouds, surrounding us in white and silver mist. Other passengers on the plane, regulars on the run, had finished their conversations across the aisle and were immersed in books or music. They enjoyed the commute before the demands of sick or worried people overtook the day. On the western side of the Spencer Gulf the plane crossed brown squares of agriculture; some greenish circles and rectangles, too, before heading along the coast. Rust and orange rocks, sandy beaches and pale cliffs caught the waves breaking below. We stopped at a coastal town to refuel. It was hot enough to put my hat on. The Spencer Gulf is the huge inlet on the left of the photo. This NASA image shows part of the area our flight covered. The city of Adelaide is the beige area on the east (right) side of the map on the smaller Gulf St Vincent. Notice the salt lakes to the north. In the waiting room of the simple airport—a modular office with toilets—Claudia and one of the doctors got the coffee machine to work. “It took a dollar more than it should.” She frowned at the machine as she sipped. We chatted with other rural and remote health workers. I asked a tall, good-natured man, a hepatologist, about the portable Fibroscan machine he carried. In regional and remote Australia, people still die from lack of diagnosis, good care and medicines for treatable liver diseases like hepatitis. The Fibroscan is a great tool for helping people understand and respect their liver. It shows an amazingly clear image. They can see how their liver has been hurt by the combat they’ve waged against it and, conversely, how it is healing under good care. Packed in a case, it looked like an ultrasound machine. “How much do you reckon that cost?” he asked me. My companions on the plane cared for people who live away from cities by choice or circumstance. Their monthly two-day visits and their advocacy for remote patients saved lives. From the coast we continued west and flew inland to the north. I saw short, hardy trees dotting the red soil—the terrain of the Nullarbor Plain. The plane turned and descended to Yalata, where two colleagues were getting off. “Looks like there’s been some rain. The hunting will be good,” I said as we waited for the propeller to stop. “They have fun hunting wombat around here. People say it’s good to eat.” My liver doctor friend smiled. Dr S called the Yalata clinic—he used to work there—to let them know that our colleagues had arrived. A clinic car showed up promptly to whisk them out of the heat. Our take-off was as smooth as all of them had been. I admired our pilot. The land below continued: olive mallee trees on red soil, fractal salt lakes—shining white or rust and grey bruised—and rippled sand hills. The red sand hills, called tali in Pitjantjatjara, made shapes like a thousand baby snakes racing each other or were arrayed in parallel undulations like stretch marks on a mother’s belly. Suddenly I notice that there was nothing to notice. The land below looked like a stereotype of a desert. The ground was flat, umber and empty. There were no plants, animals or features. I couldn’t make sense of it. I’d never seen anything like it. As plane eased down into our penultimate stop at Oak Valley, the trees and bushes had come back. I realised then that the burned earth we’d flown over must’ve been the remains of the nuclear bomb explosion sites. It gave me a familiar heavy feeling in my belly that I recognised as grief gone beyond anger. On the days before our travels, Claudia and I were concerned that there were many fires around Tjuntjuntjara. We saw them on the fire map. So I was grateful to see that the country we approached looked green. And we saw no smoke. “There’s been a few years of good rain,” Dr S said. 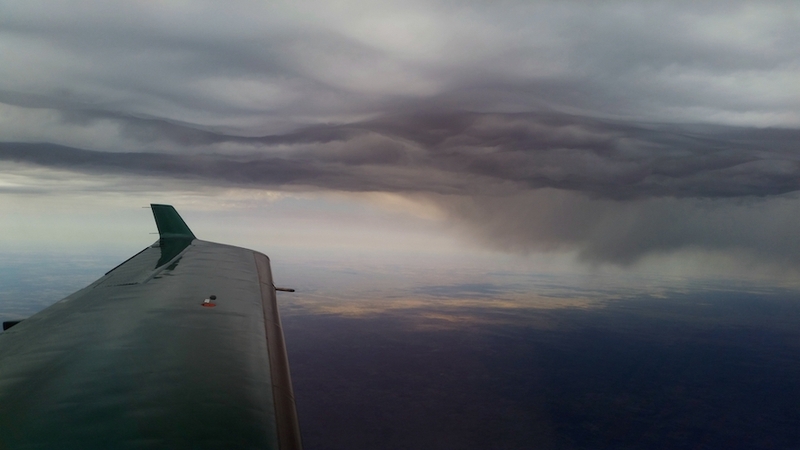 Virga, streaks of rain that don’t reach the ground, hung like watery black ink in the sky around us as the pilot made his approach to the town. Claudia told me later that she watched as he deftly moved the plane off its chartered course to weave between and around the storms. Jumping around in cross-winds, we descended to the ground for a final, gentle landing. The airstrip was dried clay, with pink and white nodules. It felt familiar, standing on it. The author and Dr S arriving at Tjuntjuntjara for work. Photo ©Claudia Jocher 2019. Our Health Worker colleague met us and took us to the clinic, then to the shop—where I bought some listless lettuce, some tomatoes and some eggs, two of which were already spoiled—and then to our shipping container house, where Claudia set about cleaning and dusting. At the clinic that day and the next I was greeted by people who remembered me and Claudia, even though our last visit was four years ago. I had the pleasure of sitting in with Dr S as he cared for patients who loved him. Many had tears in their eyes when they bid him farewell. He spoke their languages. He conveyed that fine mix of authority and deep kindness we all aspire to. The storms around Tjuntjuntjara dispersed that day without rain reaching the ground. The birds fly to the community looking for water each day. We watch them sheltering: crows, galahs and finches cluster on one side of the tree as a dust-storm blows in. It’s the Australian interior in January in the era of Climate Change so it’s way too hot. But I’m feeling privileged to be here. We both sleep well in the deep quiet of the remote desert. Thumbnail photo of the author at the plane ©Claudia Jocher 2019.